Whether he’s riding the vicious swells of the Bering Sea filming “Deadliest Catch” or capturing life in the foothills for “Experience El Dorado,” local filmmaker Todd Stanley loves his job. Todd Stanley not only is a local boy made good—the award-winning cinematographer was raised in Rocklin—he’s also intent on bringing Hollywood north. With a production studio in Placerville, the No. 1 hit show on cable TV and another series premiering this month, he may just do it. Currently the executive producer of “Deadliest Catch,” the Discovery Channel documentary series that follows commercial crab fishermen on their daring expeditions in the Bering Sea, Stanley, 38, has earned a string of Emmys and hooked unlikely fans from all around the world. His next venture is quieter, perhaps, but no less compelling, in part because it is shot in a place he loves. 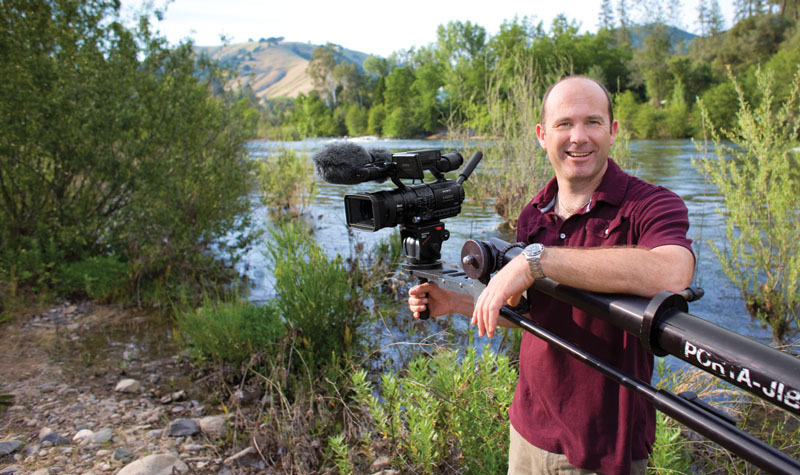 “Experience El Dorado,” which airs monthly starting July 5 on KXTV News10, showcases the Sierra foothills: the back roads, the wineries, the American River and—in every story—the interesting people who live there. Recently, we talked with Stanley about life aboard a ship off the coast of Alaska and at his home in Lotus, which he shares with his wife, Janice, and his two children: son Raleigh, 15, and daughter Jericho, 13. Q. Are you ever home? And is your family nice to you when you get back? A. I’ve been gone a lot. Hats off to my family—they put up with [it]. I’m so fortunate they let me go off and do this job. Last year, I was gone 3 ½ months straight. That’s a long time to be gone. And, yeah, they’re nice to me. Probably I’m the guy who’s the jerk—you know, re-entry into the family isn’t an easy thing. Q. Although it must be a relief, after living with all those fishermen? Q. But seriously, for these men, this job is so incredibly dangerous. What’s it like being around people who do this for a living? A. Of course, the camaraderie we have out there is great, something I’ve never experienced anywhere else. I’ve made a lot of good friends with all the guys on all of the boats. But it is hard; you’re living in close quarters, day in and day out. It’s the small things that start to get to you. Who left the lid off the milk? Who didn’t replace the sugar? And it’s an emotional roller coaster ride—you never know what to expect. Q. Is it sort of like how I imagine firefighters’ lives? Boring—and then all of a sudden, there’s this huge emergency? A. Yeah, you can get caught off guard at any time; you never know what weather is coming. [And] a lot goes on, especially when they’re out on deck working, and a crane or one of the hydraulic hoses will break. Suddenly, the whole ship is shut down and it goes into full panic mode. Q. I know it’s dangerous for them, but obviously it’s dangerous for you guys when you’re out there filming, too. Have you had some close calls? lot of guys get hurt; in fact, we have a pretty high turnover with the show. My brother, Doug Stanley, and I are the two longest-standing producers. Q. I read you have two guys on board with hand-held cameras and some stationary cameras around the ship, and by the end of the season, the [elements] have destroyed all your cameras. A. Darn near all of ’em. We wreck a lot of equipment. . . . We’ve come a long way over the years, devised some ways to protect the cameras, and some of them work pretty good, but it’s extremely wet. We’ll weld different types of camera mounts to different spots on the ship, and five or six weeks later, they’re completely covered in rust. Q. In general, this whole thing’s kind of taken off, hasn’t it? There are fan clubs, a video game coming out. Are you surprised by the reaction? A. Before I even set foot in Alaska, I said, “This is going to be a No. 1 hit show.” I just knew. It’s so compelling, the footage and what these guys are doing. It was also a show we designed as a “manly” show for men, but what we’re really finding is wives are getting involved in this, and it’s a show families sit down and watch together. A. I’ve lived here 20-something years and really just love this place. Especially after being away for a couple of months at a time, working and stuff, it’s so great to come home. We have such great resources here and so much to do, that for a long, long time it’s been my idea to do a magazine-style show on El Dorado County. The whole premise is to reach out and let people know there are a lot of great things going on [here]—and not just are there things to do, but it’s also a great place to live and it’s a great place to work. Q. And your brother is local, too? A. Yeah, and you know, we did our time in L.A. [but] we want to live here. So our big dream is to bring a little bit of Hollywood north. So that’s what we’ve been doing. We really want to have a full-blown post-production company cranking out television shows right here in El Dorado County. Q. I have a 9-year-old son who’s a budding filmmaker—have any advice for him? “Experience El Dorado” airs monthly starting Sunday, July 5 at 5 p.m. on KXTV News10. “Deadliest Catch” appears Tuesdays at 9 p.m. on the Discovery Channel.